While the churches built in the XVIIth century in Vienna have a very distinctive Roman mark, palaces are not so clearly characterized. This is in part due to the fact that while there is a definite pattern regarding the evolution of the churches in Rome, which influenced the design of those built in other Italian regions, palaces showed a greater variety; in particular the influence of Palladian architecture remained strong in northern Italy. Bissone is a very small town on the Lake of Lugano in Switzerland not far from Como: the inhabitants of the area were traditionally regarded as skilled stone-cutters. The best known stone-cutter from Bissone is no doubt Francesco Borromini who started his Roman career by shaping heads of angels for the decoration of St. Peter's. Giovanni Pietro Tencala (some thirty years younger than Borromini) left Bissone for Vienna where he became one of the most important architects. He gave an Italian touch to a palace built in 1685-87 for the Earl of Dietrichstein. The portal was modified in 1709 by Johann Bernard Fisher von Erlach, one of the main XVIIIth century architects. The palace, acquired in 1753 by the Lobkowitz, is said to have hosted the first performance of Beethoven's Third Symphony, thus its main hall is called Eroica-Saal. The image used as background for this page shows a detail of the decoration of Palazzo della Sapienza in Rome by Francesco Borromini. 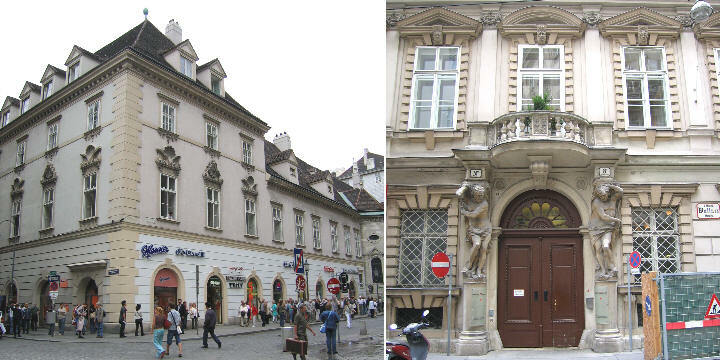 We do not know the name of the architect who redesigned the medieval town hall of Vienna, but for sure he was influenced by the works of Borromini as the curved lines of the façade and the "welcoming" portal indicate. This palace was designed by Domenico Martinelli, an Italian architect from Lucca for Ferdinand Bonaventura von Harrach in 1696-98. The Harrach were an important family in XVIIth century Vienna, more so because a member of the family (Ernst Adalbert) had been appointed cardinal. His nephew Ferdinand Bonaventura most likely owed his second name to his mother Lavinia Gonzaga, who belonged to the family who ruled Mantua (bonaventura means good luck). Another Gonzaga, Eleonora, had been the third wife of Emperor Ferdinand III. This highlights another cause for the close relationships between Vienna and Italy. The archbishop's palace was built in the first half of the XVIIth century, most likely by the Florentine architect Giovanni Coccapani, which may explain its rather simple decoration. Albert, Count of Caprara, was a nephew of Ottavio Piccolomini, one of the chief commanders of the imperial army during the Thirty Years war (1618-48). Born in Bologna, he followed the steps of his uncle and in addition to military positions he represented the emperor at the Sultan's court in Constantinople. In memory of his powerful uncle he named Enea Silvio his son (Enea Silvio being the name of Pope Pius II Piccolomini). His son played a key role in the 1683 battle of Vienna. To design his palace, not far from the Harrach palace, he called in 1698 Domenico Egidio Rossi, a young Italian architect who spent his early career in Austria and Germany. This imposing palace was acquired by Prince Johann Adam of Liechtenstein for 15,000 florins from Count Kaunitz in a partially done condition in 1694. Three Italian architects contributed to its design and decoration: the sculptures are the work of another Italian, Giovanni Giuliani. Italian artists very often set their residence in Vienna and had Austrian assistants who eventually took the lead in art matters in the next century. Giuliani, to give an example, had an apprentice by the name of Georg Raphael Donner, who designed some of the finest fountains of Vienna. The main portal of the palace is decorated with columns: a design very common in Rome, due to the availability of so many ancient columns. The smaller portal was designed in the XVIIIth century and it shows the columns replaced by atlases (also called telamons) gigantic male figures portrayed in the act of supporting the structure above them. This design became prevalent in Vienna in the XVIIIth century and it characterized its architecture; while seldom used in Rome, the atlases were common in northern Italy (see 1565 Casa degli Omenoni - external link by Leone Leoni in Milan).